Castlevania: Symphony of the Night (Sony PlayStation 1, 1997). Condition is Like New. Shipped with USPS First Class Package. 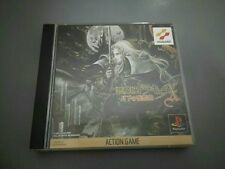 Castlevania Symphony of the Night Sony PlayStation. Game disc is completely original and authentic. Game plays flawlessly. Case and artwork are not original. Manual and artwork are extremely high quality reproductions as shown and look identical to original. This would be an excellent gift or perfect addition to gaming collection. Item will be carefully shipped within one day upon payment and is guaranteed. Castlevania: Symphony of the Night (Sony PlayStation 1, 1997) Complete. Condition is Good. Shipped with USPS First Class Package. The case is fully intact, with no cracks, markings, sticker residue, or excessive scuffing. It shows only minor shelf wear from age. The instruction manual is crisp and complete, with only minor signs of having been flipped through over the years. Castlevania: Symphony of the Night (Sony PlayStation 1, 1997). Condition is Very Good. Shipped with USPS First Class Package. Selling my personal copy. I found this at ebgames in the used section years ago. There is a used game sticker on the back of the case but otherwise everything is in great shape. Castlevania: Symphony of the Night (Sony PlayStation 1, 1997). Condition is Good. Disk only, comes in a standard disc case (case may contain scratches). Shipped with USPS First Class Package. Castlevania SotN Symphony of the Night original print black PS1. Condition is Very Good. Shipped with USPS First Class Package. Castlevania: Symphony of the Night (Sony PlayStation 1, 1997). Condition is Good. Includes game disc only. Tested and plays great. Shipped with USPS First Class Package. Castlevania: Symphony of the Night (Sony Playstation, 1997) - Complete! - Mint! Castlevania: Symphony of the Night. Role-Playing (RPG) / Platform / Action / Adventure. Very Good/Like New Condition! - THE DISC IS IN MINT CONDITION! The instruction manual is in excellent condition, too. Castlevania: Symphony of the Night PS1 Video Game. 100% Authentic Game, Not a Bootleg. Game is Complete w/ Original Case, Manual & Back Insert. Disc & Manual are in overall good condition. In pretty good shape for its age. Slight bend/ few creases to manual from being tight in the case. Disc was resurfaced to remove most flaws. Tested and in great working condition. No Writing on Disc, Cutouts On Case or Anything of That Sort. Ships same day. Check out my other Playstation 1 games. It is in great condition. See photos. I respond promptly. Castlevania: Symphony of the Night (Sega Saturn, 1998). Condition is Like New. Shipped with USPS Priority Mail. Trending at $140.24eBay determines this price through a machine learned model of the product's sale prices within the last 90 days. Please see pictures for wear, and any missing parts. Wear includes scratches, paint wear, and sticker wear. Any questions please ask and thank you for checking out this listing. Item for sale is for what is in picture and title only. Any questions please ask. All payments are and would be appreciated within 3 days of initial commitment to purchase item, unless otherwise discussed. Symphony of the Night. Good luck! Get the Best Only from Still-Luv-Nes. Very Good to excellent condition. Case is in very good condition. (see photos). Manual is complete. The manual has no tears, creases, stains or writing, It has a little white mark where it rests against the case.